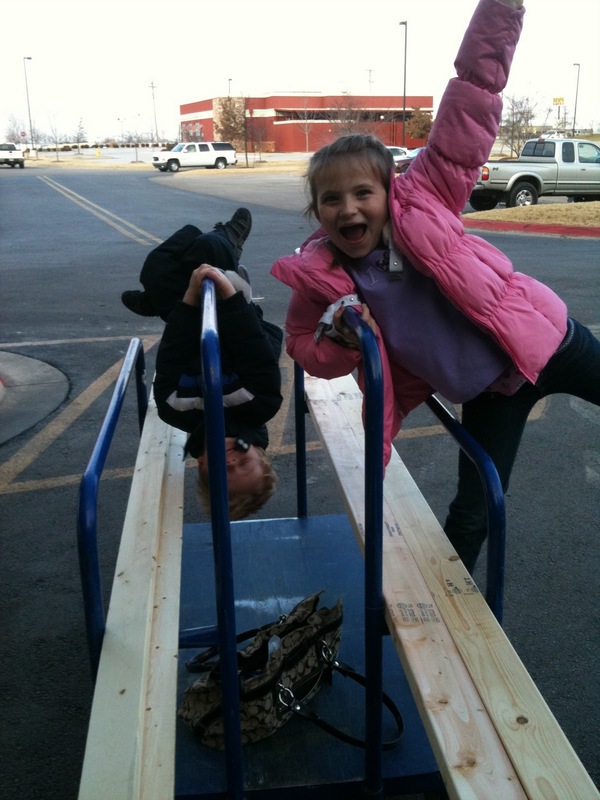 Total Gymnasts on the cart. We looked like a side-show. Yes, they really are mine. And, we got to work. I unloaded my groceries and the wood, then moved the van out of the garage. We needed Work Space. Our original plan had been to make two sleds, and the kids said they'd share, but then they wanted to paint them, and it was going to be hard since Ethan loves green. He really wanted his own. 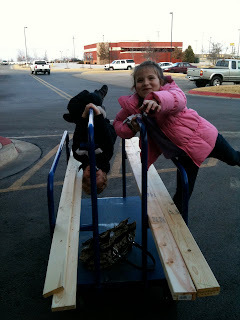 I changed the plan from two decent-sized sleds to three little sleds (the wood was kinda heavy anyway!). You can tell I thought of it after the fact, notice all the sawdust? It's probably wrong how much I love my tools, and look for a reason to use them. Then the kids' fun began. I let them set up the sleds how they wanted. Clay was very 'into' evenly spacing the slats. Ethan wanted to use screws, but my corded drill had a locked-up chuck, and my cordless drill was smoking! So we switched to nails. They are done, and awaiting paint. I got tired, started feeling sick (that's why I didn't post last night), so we didn't paint them. We knew snow was coming, so we had to pick them up and pull the van in. Ches didn't complain, but he wanted to know what we'd built when he got home. Girl, you never cease to amaze me!! They look awesome!! Hope you guys had tons of fun using them!! Awww..thank you! (..so could YOU tell what they were?) They did have fun, and we were pleasantly surprised...they WoRKeD! : ) Yay! Those are great! Glad you guys had a great time with them!